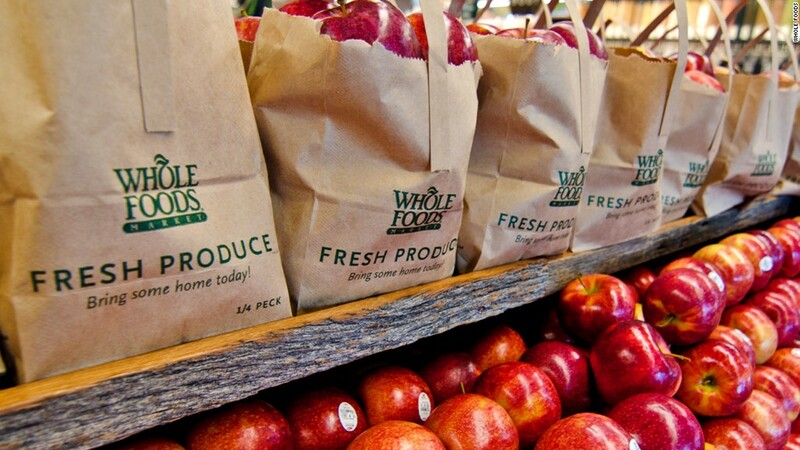 Everyone is loving Whole Foods' new low prices -- except its competitors. Foot traffic to Amazon's new grocery store jumped 17% during the week that Whole Foods cut its prices, compared to the same week a year earlier, according to data analytics firm Thasos Group. Walmart (WMT) and Kroger (KR) accounted for a combined 40% of new customers to Whole Foods between August 28 to September 3. Regular shoppers of Sprouts and Target also shifted loyalty, but it was Trader Joe's that was hit the hardest: Nearly 10% of its regular customers went to Whole Foods that week. After completing its $13.7 billion purchase of Whole Foods in late August, Amazon (AMZN) slashed the prices of dozens of items at all 460 of its new grocery stores. From fresh fish to produce, prices were down across the board. Organic bananas got a 30-cent price cut. Avocados are $1.50 less. Organic brown eggs, butter, fresh Atlantic salmon, apples, almond butter and rotisserie chickens also got major price cuts. Customers appear to be sticking around after the price cut. Although the initial surge to Whole Foods has slipped, foot traffic remains up 4% for the week ending on Sept. 16. The price cuts didn't attract customers from lower incomes, however. Whole Foods may have shed its' "whole paycheck" moniker, but its new shoppers are still coming from the wealthiest demographics. Thasos gathered the information using customers' mobile phone locations. The company was founded at MIT and is used by hedge funds to analyze data trends.